If there is one thing that I wish I hadn’t missed when I was in Cornwall, it is the Eden Project. I heard so many people rave about this place; they could go on for hours about how wonderful and beautiful it all was. Lush, marvelous, awe-inspiring; don’t miss it, breathtaking, so green, so, so amazing, “colours I never knew existed!” These were descriptions I heard over and over again. Unfortunately, I couldn’t afford it by then. Don’t make the mistake I made in England, budget it in now, I learned about it while I was there which was too late for me; plan ahead and go see it. Tickets are even on sale and cheaper online in advance. It’s £15 online as opposed to £16 at the door for adults. The Eden Project has 100,000-250,000 plant species, depending on the source, in two huge domes from two different global climates, Rainforest and Mediterranean. The Rainforest Biome, as the domes are called, is the largest greenhouse in the world. 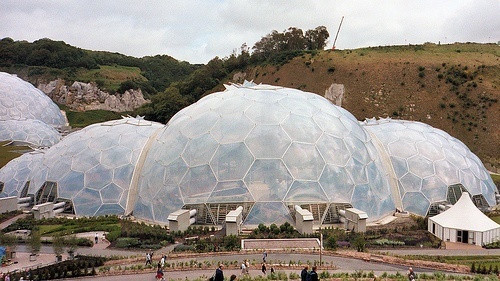 The Eden Project was opened officially in 2001 in a devastated mining area. It is a massive project to teach visitors about the environment, sustainability, the importance of many species of plants, and how we can live in harmony with nature. There is an education complex called the Core on-site where visitors can learn all about the aforementioned themes and more. Eden is also an opportunity to see many things you wouldn’t see unless you took a trip to a rainforest or all of the land around the Mediterranean Sea. The native plants spread around the massive domes are impressive as well, especially in spring. There are buses and other public transportation to Eden from St. Austell, the nearest town, as well as nearby parking lots with trams but there is a discount off the ticket price for bikers and walkers (£12 for adults). For kids there are a lot of great paths to play in with tunnels especially built for them, and the Core has many hands on activities. In winter they open up an ice skating rink. Many concerts and special events are held throughout the year in Eden. In a world losing its wildlife but becoming greener every day, we are lucky to have a place like the Eden Project, to remind us what we are working to save. 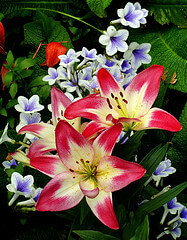 To remind us that we can live in harmony with nature and to remind us of all of the beauty these places hold. Last updated by Tracy Huddlestun on 18 November, 2009 in Destinations. Kew Gardens are awesome. Definitely a London highlight. another very nice place to visit while in England is Kew Garden. That sounds like a great place and I would like to see it.